The number of initial decisions by administrative law judges is still declining, according to 2016 statistics. In 2016, only 49 decisions were rendered compared to the 61 decisions in 2015—that’s 12 fewer. Civil penalties are also on the decline. In 2015, civil penalties were ordered in 32 of 61 initial decisions, approximately 52.5 percent. However, in 2016, ALJ only imposed penalties in 16 of the 49 decisions—32.7 percent. Notably, although wire fraud has also been a top issue over the years, civil penalties have never been ordered for the offense. This may be due to the fact that it’s a follow-on proceeding from district court actions to impose an industry ban, as monetary penalties were already ordered below. Top Enforcement Issues.As in previous years dating back to 2013, material misrepresentations and omissions continued to top the list of enforcement issues in administrative proceedings. In 2016, there were 33 actions based on this issue—67 percent, compared to 2015’s 30 actions. The second most frequently alleged misconduct was that a fraudulent scheme was involved. That issue appeared in 23 cases in 2016, compared to the mere 11 cases in 2015. 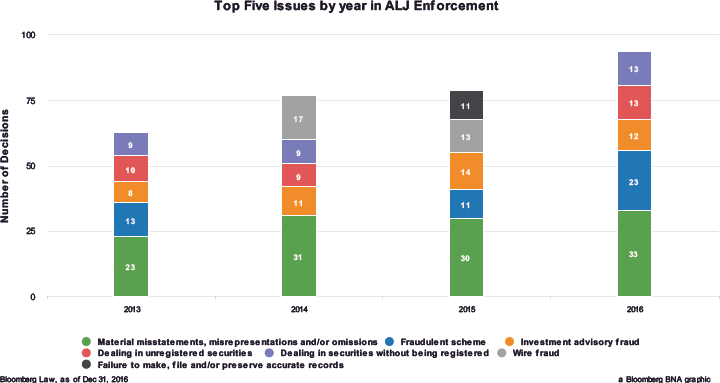 Registration violations, including dealing in securities without being registered and dealing in unregistered securities, were present in 53 percent of 2016’s enforcement actions. The issue was raised in 26 proceedings that year, up from the 18 proceedings in 2014 and the 19 proceedings in 2013. The issue didn’t appear in any proceedings in 2015. As in 2015, disgorgement figures for 2016 still remain high when compared to previous years. Disgorgement—an equitable remedy used to deprive violators of ill-gotten gains—was ordered in 14 cases in 2015, or approximately 23 percent. In 2016, ALJs ordered violators to return illegal profits in 13 cases, or 26.5 percent, representing only a slight difference. 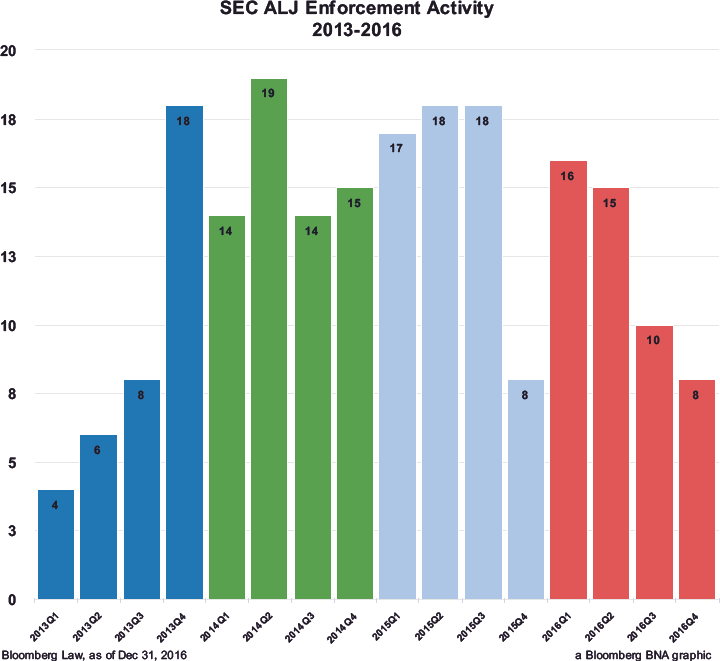 Bloomberg Law data tracks all administrative actions filed since the beginning of 2013 except for proceedings against defunct companies that are delinquent in their periodic filings. The data doesn’t include proceedings still within the 21-day period for appeal to the commission. Cases currently on appeal are included even if the commission hasn’t issued a final opinion. The data is updated on a quarterly basis.